Plants of the genus Hemerocallis, family Asphodelaceae. Some older references may still include Hemerocallis in the lily family, Liliaceae, the Xanthorrhoeaceae, or the family Hemerocallidaceae. Ancient Chinese used the plant’s roots, leaves and flowers for food. They also used its roots and crown as a pain reliever, a diuretic and for other medicinal purposes. Its botanical name, Hemerocallis, derives from two Greek words meaning “beauty” and “day,” referring to the fact that each flower lasts only one day. 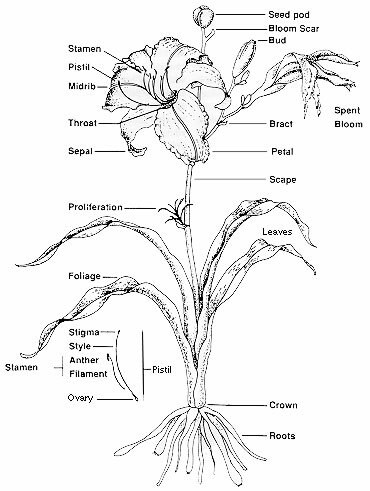 In some dictionaries and other reference works, this plant may be referred to as “day lily,” but the spelling was consolidated into a single word in 1923 upon the recommendation of the American Joint Committee on Horticultural Nomenclature, as reported by the publication Standardized Plant Names, 1923 edition, Preface, p. x and p. 199.